The missing Flight MH370 for four weeks already is the subject of talks because of so many theories emerging regarding the reason for its disappearing. 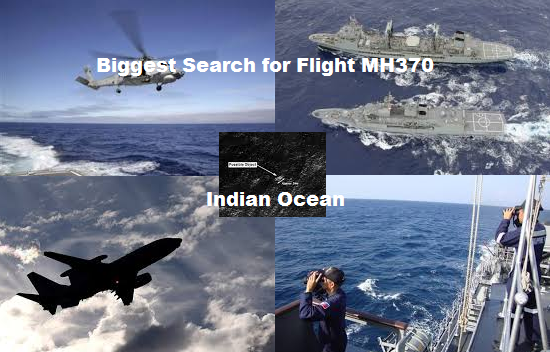 Now, the most intensive search is done in southern Indian Ocean wherein the searchers are looking for the plane’s black box recorders after the dying out of the battery. The result will clarify all gesticulations about the disappearing of the jet. Retired Air Chief Marshal Angus Houston, the head of the Australian agency coordinating the operation said that if there is no result found within 6 weeks, they will still continue the search because eventually after the said time frame, there will be objects that will float from the missing plane that will narrow their search are up to the moment that the case is solved. The said scouring will allow more or less 10 military planes, three civilian jets and 11 ships. The cover of the scouring will be 217,000-sq-km (88,000-sq-mile) patch of desolate ocean some 1,700 km (1,060 miles) northwest of Perth near that is believed to be where the plane has went down on March 8 that caused the loss of 239 lives on board the plane. The authorities are not looking at mechanical problem as the reason behind the disappearance but there are evidences showing that the plane experienced loss of communication that is eventually due to the fact that it diverted its course. The thing about the said locator is that it has a limitation. There are suggestions that it should be fully identified first that the plane has went underwater due to the fact that the Towed Pinger Locator can cover only a limited space and that it is very slow in the water. Heavy criticisms was experienced by the Malaysian authorities from China because of the very slow results of the investigation and holding back information regarding the missing 227 who are merely Chinese.